Pirin National Park covers a mountaine range composed of limestone rocks with a granite nucleus, which is noted for its variety in flora and high scenic beauty. It encompasses the larger part of the Pirin Mountains in the southwest of Bulgaria. The huge relief diversity of the park is the reason for the variety of plant species on its territory. About 1300 species of higher plant species can be observed within the park, which constitute more than 30% of all higher plants on the territory of Bulgaria. Besides this, about 300 moss species and a large amount of algae have been determined. The park is a home to 18 local endemic species, 15 Bulgarian and many Balkan endemic and a large quantity of preserved species, such as the Edelweiss, a symbol of Pirin. 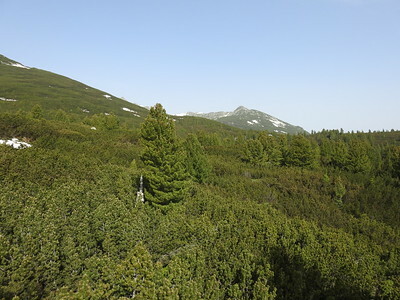 Three plant belts are differentiated within the Pirin National Park, a forest one, a subalpine one and an alpine one, which is due to the relatively high location of the entire park. Who could have known that a skiing region would still be snow covered in Mid-April? Apparently everyone but me and two Spaniards, because we were the only ones hiking in Pirin National Park that day. The trails were covered by snow and hard to find. It was quite a strenuous effort just getting to Vihren hut which normally would be the start pointing for a proper exploration of the park. And it took me 30min just figuring out where the trail actually started. On the upside it was a pleasure hiking in the snow covered landscape for myself. I get Solivagant’s comment about the OUV of the site. If this is inscribed, every second mountain valley in Switzerland should be on the list. But well, it was a nice contrast to the sunny coast in Greece. Bansko is well connected by bus. As stated in my Philippi review you can also travel onwards to Kavala in Greece. The train connection sounds fantastic, but is very time consuming. Also the schedule didn’t work out for me. 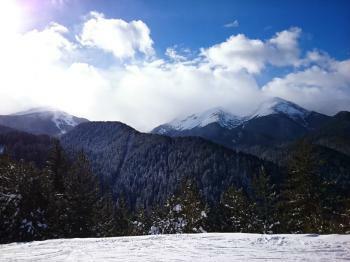 Bansko in general is fairly pleasurable as skiing resort towns go. To get into the National Park from Bansko you can take the cable car. It seems it also operates during summer months for hikers. You will be in the park, but in the ominous buffer zone due to the area being developed for skiing. From there you can hike on to the huts. Banderitsa is the first hut and Vihren the next one. Both are in the core zone as far as I could tell. From Vihren you have multiple options to hike on. Unless you arrive during snow season. If you want to hike, April is still too early. I would wait till May or June. Solivagant seems to imply that even June is too early. Although I initially visited Pirin National Park WHS in summer 2010, I went back there for skiing at the Bansko ski resort, located within the Pirin NP, in January. 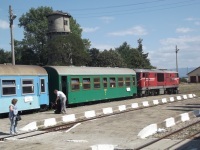 Both times I took the narrow gorge train from Septemvri to Bansko and took bus back to Sofia. The scenery from the train was quite pleasant both in summer and in winter. As it turns out, the ski resort is located within the buffer zone of the WHS; however, if you look at the map of the WHS, you see that the buffer zone is almost surrounded by the core zone, which means that it appears as if the ski resort is protected by the core zone of the WHS, oddly enough. This photo shows part of the pistes in the buffer zone to the left and the core zone to the right. If you are visiting Pirin, I doubt that any of the readers of this blog is interested in the 300 species of mosses and algae from this site. Instead of just driving around, an alternative is to visit Baikousheva Mura, the oldest or second oldest tree in Bulgaria, dating to over 1300 years old. This also makes it one of the older trees in Europe. It was named after the forest ranger that found it and its a Bosnian pine tree. You can Google to get images of this giant. To get there, you first get to Banska, a huge ski resort that detracts from this WHS. Then you need a car rental or taxi and head up the road up the mountain. I suspect there is only one road up. The destination is Banderitsa Chalet which is 16km up the mountain and its an apres ski tavern. Banska is at about 900m ASL and Banderitsa is above 1900m ASL. I was there in early May and by 1500m, there was still a lot of snow on the ground. Fortunately, the roads were clear all the way until Banderitsa. Once you get there, the path to the tree is behind the chalet and its supposed to only be a ten minute hike up the hill. Unfortunately the snow was still deep and we only had street shoes. Having come all this way, we made our way up sometimes knee deep. It took twenty minutes and destroyed our shoes! Once you come close, there are wooden steps up to the tree so that visitors do not damage the ground and the huge root system. This tree is huge! It has a height of 26m, 7.8m in circumference. Not close to the American Redwoods but big enough for a lot of photo-ops. At this elevation, the mountains were also pretty with snow caps. Great way to tick this site off. This is a site where the journey reaching it is more exciting than the destination. I travelled from Septemvri to Bansko on the slow narrow gauge railway that winds its way into the Pirin Mountains. The secenery and views visible from the train were well worth the 4 hour journey. Bansko is essentially a ski resort, but in summer hosts a few hikers. From the top of the cable car there a number of trails up to viewpoints in the mountains. Gotse Delchev is more laid back, and hikes to the Yulen Reserve begin in the town. Buses link Gotse Delchev and Bansko with Blagoevgrad and Sofia. “Natural WHS” seem to me occur in 2 categories – sites with a visible “Wow factor” in the form of some (near) “world unique” geological or wildlife sight which makes them worth undergoing a long journey to see (eg Grand Canyon or Bwindi), and those which, for reasons of remoteness, government action or luck have largely escaped the depredations of man and remain in a reasonably pristine state to demonstrate what some particular ecological niche or climatic zone once looked like. Usually in these latter cases the botanists or zoologists are still able to conjure up some relatively unknown species which is endemic to the area in order to back its “unique importance” (or am I guilty of “speciesism” in regarding a site containing “Gorilla gorilla” as more justifying WHS inscription than one containing “Pinus heldreichii”!!). In my opinion such sites are really only worth picking up if you are in the area and just want to experience some interesting countryside. If Pirin’s inscription has a justification it is of this second category! It contains attractive, if unremarkable, mountain scenery which will provide a pleasant escape from civilisation and interesting hiking opportunities. As such it is clearly worth preserving. But there are already means of recognising and protecting such sites- The UNESCO Biosphere Reserve program is one and many of the “Natural” WHS are also listed under that scheme (http://www.unesco.org/mab/BR-WH.htm). 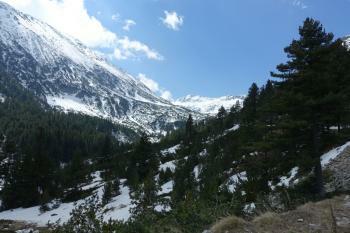 Pirin is one of those on both lists – but only the “heart” of its WHS site is a Biosphere reserve. Given that WHS inscription is supposed to represent the “highest” level of recognition a place can be given I find this rather surprising. Pirin was inscribed as early as 1983. The document showing the reasons for inscription is only in French but refers to the number of endemic species of plants – Bulgarian and Balkan. There is an “extremely rich flora which doesn’t exist anywhere else” with a wide mixture of species from various parts of Europe. I am no botanic expert but, apart from the species referred to (which differ at each site) , much of the argument seems remarkably similar to the that given for Dormitor (which in world terms is not that far away) when it was accepted 3 years earlier – Limestone karst, endemic species, glaciation etc etc. I certainly didn’t find anything particularly special to photograph scenery wise so my photo, I am afraid, is merely a “family snapshot” of a pleasant day in the mountains! It is pleasant hiking country but, in the great scheme of things, not that special. In early June there was still snow around. A. Mehmet Haksever Alexander Barabanov Alexander Lehmann Alfons and Riki Verstraeten Anna Wludarska Argo Atila Ege Bas Bin Botev Cezar Grozavu Craig Harder Daniel Chazad Dimitar Krastev Dirk-pieter Donald M Parrish Jr Esther Westerveld Eva Kisgyorgy Filip Murlak G. ingraham G.L. Ingraham Gi Goran Doychev Hdimoshi History Fangirl Hubert Iain Jackson Ivan Rucek Jarek Pokrzywnicki Jaroslav Klement Jean Lecaillon Joel Baldwin John Smaranda John booth Jonas Kremer Jose Antonio Collar Joyce van Soest Judith Tanner Lorenzo Mejino MHL Martina Ruckova Michal Marciniak Mikko Milan Jirasek Milena Tzoneva Miloš Tašković Nan Nihal Ege Nils Kronenberg Paw90 Petteri Randi Thomsen Roel Sterken Roger Ourset Roman Koeln Roman Raab Rosen STEFAN Sabrina Liebehentschel Sazanami Schnitzel Shandos Cleaver Sncjob Solivagant Stetrab Stijn Svein Heltberg Szucs Tamas Tamara Ratz Thomas Buechler Thomasvdw Tsunami Vernon Prieto Vladimir WILLIAM RICH Wait About Walter H.